Performing custom work can be an additional source of income for farm operators around the state. For others, custom work is a full-time career. When labor is available, and another party has equipment, renting equipment for a short- term is also a common practice. While only a small portion of Iowa farmland is completely custom farmed, many farm operations rent equipment or hire out one or two operations on their farm each year. The 2018 Iowa Farm Custom Rate Survey canvassed 456 farmers, custom operators, and farm managers from the state, putting together a guide for pricing custom machine work. A total of 124 usable responses, giving 4,043 custom rates were received from Iowa farmers, custom operators, and farm managers. Thirteen percent of the respondents performed custom work, 23 percent hired work done, 42 percent indicated doing both, three percent indicated doing none, and 19 percent did not indicate whether they perform or hire custom work. The publication, which can be found online at the Iowa State University Extension and Outreach Store (FM 1698) or on the Ag Decision Maker website (File A3-10), provides rates for custom work in the following categories: tillage, planting, drilling, seeding, fertilizer application, harvesting, drying and hauling grain, harvesting forages, complete custom farming, labor, and both bin and machine rental. Newly added operations in 2018 include values for strip tillage and planting with a high-speed planter. All rates include fuel, repairs, depreciation, interest, labor, and all other machinery costs for the tractor and implement unless otherwise noted. The average rate and range for each machine work function were compiled into the survey as usual, as well as the median charge and number of responses for each category. For the survey, the average is calculated as the simple average of all responses. The median is the response that splits all the ordered responses (from smallest to largest) in half. The survey found there was a 5.6 percent price decrease across all surveyed categories. 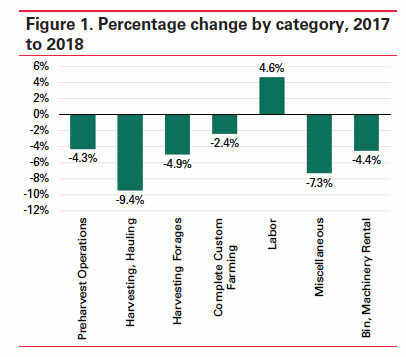 The change from 2017 to 2018 varied across categories, with harvest and hauling grain costs decreasing 9.4 percent and labor costs increasing 4.6 percent. Figure 1 shows the percentage change in each category in the survey. Table 1 shows historic rates for a sample of operations from the survey. "Even with an increase in the price of diesel fuel assumed, the majority of operations reported a rate decline, this is in response to tight margins continuing for farm operations across the state," said Alejandro Plastina, assistant professor and extension economist with ISU Extension and Outreach. "We appreciate the respondents to the survey, as the information available in the Custom Rate Survey is only possible due to their responses provided each year." The reported rates are expected to be charged or paid in 2018, including fuel and labor. The average price for diesel fuel was assumed to be $2.95 per gallon. The values presented in the survey are intended only as a guide. There are many reasons why the rate charged in a particular situation should be above or below the average. These include the timeliness with which operations are performed, quality and special features of the machine, operator skill, size and shape of fields, number of acres contracted, and the condition of the crop for harvesting. The availability of custom operators in a given area will also affect rates. Any custom rate should cover the cost of operating the farm machinery as well as the operator’s labor. The Ag Decision Maker website offers a Decision Tool to help custom operators and other farmers estimate their own costs for specific machinery operations. If you are interested in joining the 2019 Custom Rate Survey mailing list, send mail or e-mail address to: Alejandro Plastina, Iowa State University, Department of Economics, 478E Heady Hall, 518 Farm House Lane, Ames, IA 50011-1054, 515-294-6160, plastina@iastate.edu.